Adam, a 14-year-old Romani boy from the settlements, learns his father has been killed. No one knows what happened. There is no evidence and no witnesses. After the funeral, his mother does not mourn long. She wants to guarantee her children's security, so she marries her brother-in-law, the loan shark and thief, Žiga. Adam's life changes from one day to the next. He has suddenly grown up. He helps his mother, takes care of his siblings, and does his best to protect them from Žiga's influence. He has only two joys in life - his training as a boxer and his black-eyed girlfriend Julka. When his mother is taken to the maternity ward, his stepfather draws Adam and his brothers into his dubious business. Police arrest the boys in the act of stealing and only the fact that they are minors spares them from prison. Adam gradually loses everything that gave him security: They throw him out of the boxing club and Julka's parents send her to the Czech Republic. The boy finds himself more and more in conflict with the laws of his own community. While arguing with the cynical Žiga, he realizes who is behind his father's death. He tries to escape this hopeless situation, but his efforts end tragically. Speaking at a press conference yesterday at the Karlovy Vary film festival, Slovak director Martin Šulík said his film "Cigán" ("Gypsy") is his most personal work. The film had its world premiere as part of the festival's main competition. Šulík says the image Slovak people have of Romani people is very distorted and incomplete and that his film wants to show what life is really like in the Romani settlements. The film, a Czech-Slovak co-production, tells the story of a boy who tries to leave the settlement after his father dies in order to improve his siblings' lives. He finds himself in conflict with both the cultural, racial, and social prejudice of the larger society and with the unwritten laws of his own community. "In Slovakia, between 200 and 300 000 people live in poor social conditions. The only images we have of their lives are from television and are very distorted. We know there is crime there, we know there are drugs. However, we want people to start thinking about the concrete situations that those living in such environments must address," Šulík told the Mediafax press agency. "We have done our best to make a film about a person in an existentially extreme situation. The problem of the settlements in eastern Slovakia is not one of nationality, but a social problem. It's a problem of education and poverty. The will to survive often forces people to break the law. The main protagonist, Adam, faces the problem of how to survive in life, like many other young people. He internally disagrees with the world around him and it is very hard for him to find a a way out of it. He runs up against both harsh conditions in the larger society and the deformed rules of the ghetto," the director was previously quoted as saying. "The filming was done in a standard way, all of the usual agreements applied and the dialogue was performed exactly according to the screenplay," he told news server Lidovky.cz. The director says he would like the film, which offers a view "from the other side", to influence viewers to stop perceiving the Romani settlements as a homogeneous mass and instead to focus on the lives of the individuals living in them. He and screenplay author Marek Leščák wanted to show what the world looks like to a teenager living in an environment of extreme poverty, facing existential pressures and racial prejudice. The pair traveled through many Romani settlements over the course of six months and were overwhelmed by the authentic material they collected. The film was made in an actual Romani settlement in eastern Slovakia and the main roles are played by Romani people who are not professional actors. 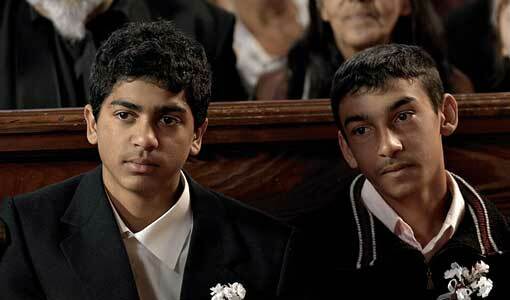 "We definitely wanted to cast only Romani people. We didn't want the characters to be played by gadjos [non-Roma] painted with shoe polish. Because there are many Romani dialects, we chose the dialect spoken in the Spišská district and cast the potential actors according to their dialect," Šulík said. "We wanted people to hear the Romani language also." "I always thought it would be easy to be an actor, but it just looks easy," Janko Mižigár, who plays the main protagonist, told journalists. Apparently the filming has not changed his life at all. "The director has managed to show life in the settlements in all its nakedness and the film is truly realistic. We hope it will help us all to find a way out, or at least open up discussion," said another actor, Attila Mokoš. "No one has seen the film yet. It will premiere in the Czech Republic on 7 July [sic] and in Slovakia on 12 July in the place we filmed it - in Richnava, where 1 500 Romani people live. We'll see whether they praise us or whether they have a different response - if they don't like it, read the crime pages," the director said. 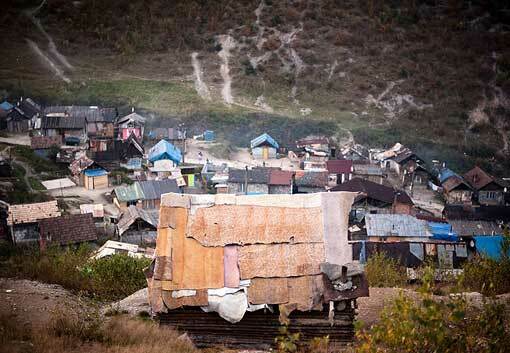 More than 200 000 Romani people live in total poverty in similar settlements across Slovakia. Politicians refer to them as "inadaptable" citizens or as the "Roma problem". After making the film, the director views many things differently and says he has befriended many of the "actors". "It's not a homogeneous mass, but many individuals with their own fates," he explained to news server Lidovky.cz. "It's important for gadje and Romani people to start facing all of their social and other problems together. Neither can do it alone. This should start immediately - yesterday would not have been soon enough," Šulík told the Karlovy Vary Festival daily. The filmmakers would be glad to screen the film at other international festivals. In their view, the topic is not just a Central European one because it is based on the worldwide problem of xenophobia. This wish is gradually coming true; after Karlovy Vary, the film should also screen at a festival in the Canadian city of Toronto. Producer Rudolf Biermann of the In Film company has already produced the films "Roming" ("Roaming") and "Král zlodějů" ("The King of Thieves") on similar topics. "In the end we got the financing thanks to foundations and public television in both countries," he said, acknowledging that it is not easy to find viewers for such a film. "We know it's not easy to get people to go see a film like this. However, I am sure that once they do, they'll like it," the producer said. The Prague Bontonfilm company will be offering the film to schools in September. Slovak Railways has caused the filmmakers problems in reaching viewers by refusing space for the film's ad campaign, allegedly due to its racial overtones. According to Biermann, the Garfield Film company, which is distributing the film in Slovak theaters, has reserved and confirmed its leasing of media space for all of July. The company has produced 3 000 posters showing a completely innocent photograph of a young Romani couple and a brief text. The distributors say Slovak Railways' ban shows the kind of racial intolerance they are up against. "This shows the film has really come out at the right time and in the right place," distributor Denisa Biermannová said. The world premiere of the film took place on Tuesday at 20:00 CET in the Thermal Grand Hall. A second screening is planned for today at 10:00 CET in the Espace d'Orléans. Young Roma actors, together with the Kesaj Tchave Roma children's folklore ensemble, will share the $20,000 that the Slovak makers of the film Cigán (Gypsy) won at the Karlovy Vary International Film Festival, with the filmmakers telling the SITA newswire that they originally had absolutely no idea that the special jury prize also included a financial award. The producer agreed with the film's director, Martin Šulík, that $12,000 will go to the film's three main actors, Janko Mižigár, Martina Kotlárová and Martin Hangurbadž. The funds will go to a special account for their further education. The remaining $8,000 will be donated to the Kesaj Tchave Roma children's' folklore ensemble managed by Helena and Ivan Akim who had helped the film's creators in the initial phases of the production. In its first week in Slovak theatres, 8,976 viewers had seen the film, surpassed only by the last Harry Potter sequel in first-week attendance.